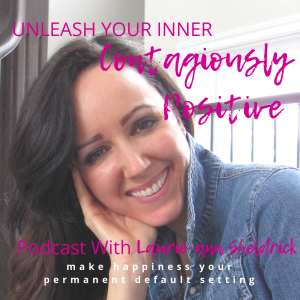 Are you ready to unleash your inner contagiously positive? If you just said, “heck yes!” that’s why I’m inviting you to take part in this 9-week online course. 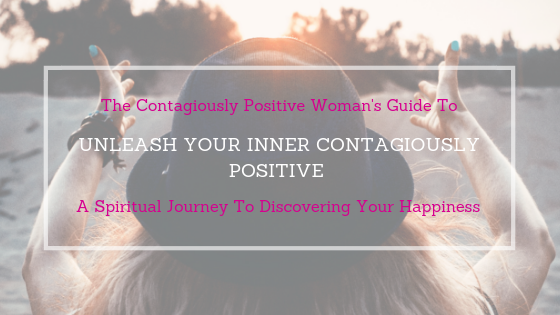 Unleash Your Inner Contagiously Positive is a spiritual journey to discovering your happiness within. Using vulnerable truth telling, I share what I believe are necessary techniques to transform limiting beliefs, fears, negative thinking, past pains, shame, guilt and resentment, so that you can unleash your inner contagiously positive. These inspiring tools will help you release the blocks in your life and make happiness your permanent default setting. Before I decided to commit to making happiness my default setting, I was unhappy, stuck in the negative vortex (I had actually taken up permanent residence there), I was stressed out, burnt out, unhealthy and felt sick and tired all the time. Not to mention I had no vision, my relationships were struggling, I had no idea what to do next, I had no goals and absolutely zero idea on how to get from where I was (miserable and unfulfilled) to where I want to go (happy-land). I went from feeling spiritually, emotionally, physically bankrupt (depleted), to being dubbed Contagiously Positive. We all need a little guidance sometimes. In this 9-week course, I guide you through the techniques that I use for my own life and the tools that I have been taking my clients through to get you from where you are to where you want to go – while also busting through all the obstacles that are or be in your way. Is this course calling out to you? Find out by clicking the image above for full details. A decision is just another road to follow. You can always choose a different road when you reach another decision fork.